The Skywards Miles you earn with your card get transferred to your Skywards account weekly and reflect in your statement. You can enjoy up to four ‘buy-one, get-one’ complimentary movie tickets each month on any day of the week with your Citi Credit Card. Enjoy complimentary marhaba Silver Meet & Greet service and experience a smooth journey through Dubai International Airport. As an Ultima Cardmember, you can apply for unlimited free supplementary cards for your family members (spouse, siblings and children over 15 years of age). 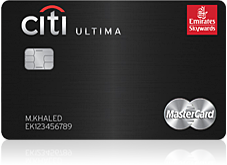 Being the primary cardmember, the Ultima Mastercard comes in an exclusive metal version for you and in non-metal for your supplementary cardmembers, who can also get the metal version of the card for a one-time fee of AED 1,000 per card. 1.5 Skywards Miles per USD of FX spend. Sign-up Skywards Miles will be awarded provided that the customer has activated the Credit Card within 60 days from the cards approval date and has paid the entire Annual Membership Fee of AED 3,000 and any amount which has been levied on the card by the first payment due date as determined by Citibank. Sign-up and Bonus Skywards Miles (25,000 sign-up and 10,000 yearly renewal Miles) will be credited to the card member's Skywards account 45 business days after the full payment of the Annual Membership Fee of AED 3,000. Citibank may apply and/or reduce Skywards Miles awarded per US Dollar spent on the Card to certain spending (i.e. utility bill payment) at its sole discretion. Purchases made on www.emirates.com for tickets need to be completed in AED Dirhams to qualify for 2.5 Skywards Miles per USD earning. Purchases made on www.emirates.com in other currencies will earn 1.5 Skywards Miles. For a detailed list of exclusions or updates on the Miles earn rate, please click here. Emirates/ Skywards Programme terms and conditions apply and are available on www.skywards.com. Citibank and Partners Terms and Conditions apply, are subject to change and are available upon request. For the current Citibank Terms and Conditions, please visit our Website www.citibank.ae. Citibank N.A. makes no warranties and assumes no liability or responsibility with respect to the products and services provided by partner(s)/other entity(ies).